The Phillipsburg football team has discussed a 13-0 season since the start of the year. The Panthers have never had a perfect record in school history nor won 13 contests in a single fall. The last five years are the best run in Phillipsburg annals, though three of the seasons ended with tough, close playoff losses to teams the Panthers were favored to beat. In ’14, Phillipsburg reached sub-state for the first time, finished 10-2 but lost to Ell-Saline by one point. In ’15, the Panthers broke through, went 11-2 and defeated Troy, 30-29, to win the Class 2-1A state title. Two years ago, Phillipsburg collected an 11-1 mark in Class 3A, ran into Hesston’s outstanding passing attack and fell in the quarterfinals, 38-26. Last fall, the Panthers were favored to come out of 3A West. Phillipsburg beat Hesston, 47-7, in the playoffs. Phillipsburg missed standout quarterback Trey Sides for the postseason because of injury. The Panthers had not allowed a first quarter point until they hosted the 3A sub-state title game. Marysville led 8-0 after the first quarter, and beat Phillipsburg 30-24. The Panthers set a new school mark for single season victories with a 12-1 season. All three losses – Ell-Saline, Hesston and Marysville – came at home. This year, Phillipsburg has again dominated the first quarter. However, the Panthers have delivered back-to-back comeback playoff victories. The Panthers won an epic contest, 25-24, at Conway Springs in the quarterfinals. Last week, Phillipsburg trailed 7-0, held off upset-minded Hoisington and pulled away late for a 31-14 home victory. The game was scoreless after the first quarter, and Phillipsburg immediately responded with a long touchdown run from senior Nathan Moon after Hoisington took a lead. “Dogfights telling us we need to play together as a team, which we have been able to do,” Moon said of the last two weeks. 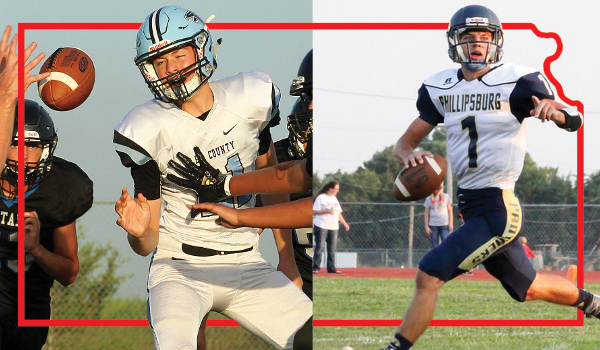 Late in the third quarter, Hoisington closed to 17-14 but again the Panthers rallied behind the playmaking of senior quarterback Trey Sides, a four-year starter. Phillipsburg had beaten Hoisington, 51-21, in district play. On Saturday, No. 1 Phillipsburg (12-0) plays No. 2 Riley County (10-2) in the Class 2A state championship game at Salina. Start time is 1 p.m. This marks Riley County’s third trip to a state game after losses in ’88 and ’93. Phillipsburg has defeated Riley County in the playoffs the last two seasons when both teams have been 3A West (49-27, 48-13). Riley County has overcome its own playoff hurdles. The Falcons, with 35th year coach Steve Wagner, ended a 22-season losing streak versus Mid-East League rival Silver Lake. In the regular season, the Falcons fell to Silver Lake and Southeast of Saline. In the playoffs, Riley County beat Southeast of Saline and Silver Lake in back-to-back weeks. Against Silver Lake, Riley County won 40-34 in overtime. The Eagles led 34-21 with two minutes left. Junior Garrett Harmison, who set school single game records for passing yards and completions in the contest, threw a TD pass to Mikey Waggoner to cut the advantage to 34-28. Riley County recovered an onside kick and had a game-tying pass from Harmison to sophomore Nic Allen. Riley County’s potential game-winning extra point was blocked, but the Falcons earned the victory in overtime when they scored, and then tackled Silver Lake receiver Wyatt Heiman just short of the goal line. It marked Riley County’s first semifinal berth since ’96, also the last year it beat Silver Lake. Last week, the Falcons rolled over Humboldt, 46-16. Overall, Harmison has completed 139 of 231 passes for 1,930 yards for a 23/10 TD/INT ratio and has set a school record for single season passing yards. Waggoner has exceeded 1,000 yards in back-to-back seasons with 196 carries for 1,147 yards and 22 scores. Wagner has been highly pleased with his offensive line with four seniors and four returning starters, along with skill position depth. Three players have at least 30 grabs and five have at least 11. The Falcons went from a team that ran the ball 90 percent of the time last year to 64 percent in a spread look this season. “We felt like we had good receivers,” Wagner said. Riley County has committed 17 turnovers, though is plus-11 in turnover margin. Senior Wyatt Earhart has 83 tackles, 17 for loss. Senior Tristan Kulp has enjoyed an all-around great season with 15 offensive scores and seven interceptions. Phillipsburg has enjoyed another fine season from Sides with 57 of 101 passing for 1,024 yards with a 19/6 TD/INT ratio. Senior Treylan Gross has 115 carries for 1,325 yards and 22 scores. Moon has tallied 746 yards and nine TDs. Gross and sophomore Ty Sides have combined for 28 catches, 14 for scores. Senior Cha’ron Ellis suffered a severe concussion against Hoisington and was helped off the field and taken to the hospital. Ellis has 96 offensive touches for 880 yards and nine TDs. The Panthers have just 12 turnovers and plus-15 in turnover margin. Against virtually every team outside of perhaps Plainville, Phillipsburg has enjoyed a significant edge in the kicking game with senior Jonathan Hunnacutt, the state’s all-time leader in career kicking points and a starting defensive end. Hunnacutt had a key blocked punt along with a forced fumble and sack on the same play last week. He is 8 of 9 on field goals with a long of 52 and 67 of 69 on extra points. Riley County is 28 of 38 on kicking extra points and has not attempted a field goal this fall. Senior Kasen Keeten leads with 135 tackles, and senior Jaret Shelton paces the Panthers with 10 TFLs and six sacks. Hunnacutt was critical in the win against Conway Springs. The Cardinals scored on their first possession, led most of the contest and outgained Phillipsburg, 371-292. Conway Springs had four touchdowns but went 0 of 4 on conversions. The Panthers tallied three touchdowns with two extra point kicks, a two-point conversion and a Hunnacutt field goal. “It was pretty intense for sure,” Sides said. “Conway Springs, they were a great team. We just couldn’t stop their run, and we were shooting ourselves in the foot on offense, too. So just our mentality to not give up and continue to fight, that really paid off. Coaches were stressing to stick together. Last week, Phillipsburg was inside the Hoisington 5-yard line on the game’s first possession but the Cardinals stopped them. Hoisington, led by 2,000-yard junior back Wyatt Pedigo, had multiple clock-churning drives, including an 8 minute, 4 second one to open the third quarter. When Hoisington scored, Covington heard the sideline saying to “just stay the course” and answer the Cardinals’ touchdowns. Sides had two great completions, the second a touchdown pass on a broken play to Gross, as the Panthers quickly bumped the lead to 24-14. “The last couple of weeks we have kind of proven to ourselves that we are resilient,” Covington said.